Hello you makeup mavens, beauty buffs, fashionistas, and hair-crazed lovelies! We are so thankful to have all of you reading our blogs. As a token of our appreciation, we are going to be holding this super awesome giveaway! 1. Be subscribed to our blog! This will ensure that every time we post a new article, you will be informed so you can check out our tips and tricks. This is to keep you in the loop of everything beauty and fashion! 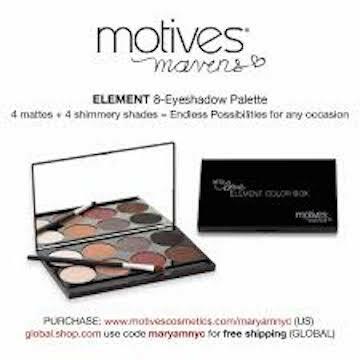 Categories: Other | Tags: beauty, contest, cosmetics, fashion, giveaway, makeup artist, motives, themakeupmovement | Permalink. You may have heard or seen the growing hype about apple cider vinegar and the health benefit claims, but what really does apple cider do for our well-being and why is it so good for us? Apple cider vinegar is the fermented liquid that comes from crushed apples. It contains vitamins B1, B2, and B6, folic acid, vitamin C. Apple cider vinegar traces can be found in some medicines. It aids in cramps, stomachaches, weight loss, sore throats, high blood pressure, and helps fights infection. Additionally, apple cider vinegar can be applied to the skin to fight acne, soothe sunburns, and calm insect bites. Further benefits can be found here. ACV has some great uses when it comes to beauty treatments. Make a detoxifying face mask by mixing honey, ACV, and bentonite clay for a deep-cleaning pore mask. Another way to incorporate this into your routine is by gargling with it each morning. This is helpful for two reasons because it helps fight bad breath and also removes stains leaving your teeth more white. Also, it can be applied to the hair after shampooing. This has vitamins which bump up the natural shine and gives the hair a healthy sheen. Furthermore, now that it is summer, you are sure to be out in the sun whether running errands, hanging out with friends, or taking a trip to the beach. The harsh summer rays can damage your skin and leave you with unsightly sunburns. To soothe any sun damage, add 1 cup of ACV to your bath and soak in the water for at least 10-15 minutes. If you combine ACV with two parts water, soak it with a cotton ball, and then apply it to the face, this will work and can completely replace your toner. This is more cost-firendly and a better organic substance to apply on your face. If you have long-time acne scarring on your face, dabbing the ACV concoction on your face before bed can diminish their appearance and help it to fade over time. Want more beauty tips? Just check here. Some health benefits include weight loss. It helps you lose weight because it increases and speeds up your metabolism. Taking 2 tsps of ACV and mixing it with 8 ounces of water is a concoction you can take three times a day typically before each meal. The calcium, magnesium, and potassium found in ACV also helps to maintain bone health keeping them strong rather than brittle. Learn more about ACV here. ACV is not just used for beauty and hair treatments, it can be used as a more healthy way to clean your home. It can replace harsh chemical cleaning products as apple cider vinegar is all natural. If you leave the ACV in your toilet over night, it will leave it smelling like apples by the morning. Use ACV to disinfect your telephone, countertops, and doorknobs as well as any other surface that can accumulate germs and bacteria. Most importantly, this is safe to use around children and pets because of its organic state. Read more about how apple cider vinegar can get your home clean here. Do you want to learn how to make an even healthier apple cider than the ones your purchase from the grocery store? Well, you can make your own! There are various ways and recipes to create apple cider vinegar. What’s great about making it at home is that you can use scraps of apples and the core that you usually just throw away. Or if you have an apple tree, you can use the entire apple too. Check some of the methods out here. 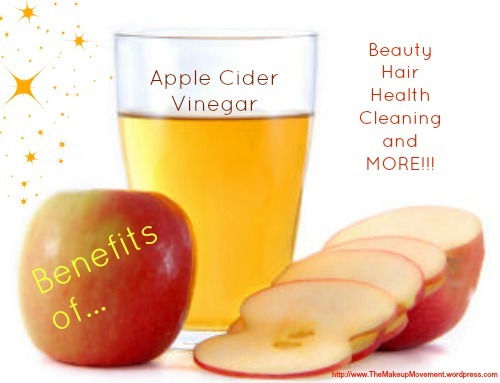 As you can see, apple cider vinegar has a plethora of benefits that you can take advantage of! Have you ever heard the saying, “you are what you eat?” Well, this couldn’t be anymore true! We don’t mean that if you eat a lot of chicken, you will transform into one, what we mean is that what we consume plays a large role in how we look and feel. In order to have radiant skin, bright eyes, shiny hair, and strong nails, it is critical to eat a diet that is rich is nutritious value. 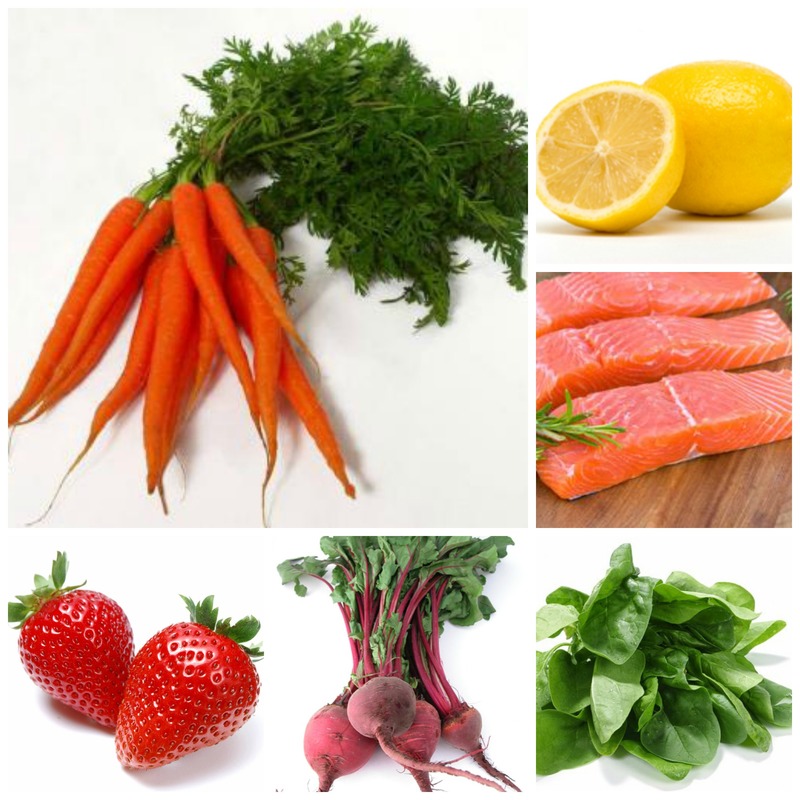 Here are some tasty ways to get beautiful from the inside out! Carrots: These orange beautifies are not just good from eyesight, but they are packed with carotenoids that when exposed to UV rays, it minimizes the amount of sensitivity to your skin. Additionally they carry beta-carotene and vitamin A which aids in the repair of skin tissues–perfect for if you are a beach babe or outdoor kind of girl. Salmon: We might not all like fish, but this is something you should try to develop a liking to. Salmon is filled with omega-3s, this is an important vitamin that our body needs, but cannot produce itself. The body must rely on food sources to obtain and absorb this necessary vitamin. Also omega-3 helps to boost your mood and makes your feel absolutely irresistible. Strawberries: Who knew that such a delicious and popular fruit could be so healthy and good for us? Strawberries are especially great for our skin. They helps prevent aging, reduces acnes and blemishes, protects the sun from harmful and damaging UV rays, minimizes the amount of oil on your face, and even works to lighten the skin. This super fruit is tasty and you can enjoy it knowing that with each bite you are getting closer to more beautiful skin! Lemon: This is probably one of the most overlooked and greatest beauty foods around. Yeah we have it squirted in our water and over some of our food, but do we really understand how great lemons really are? Lemons help to clarify skin, treat blackheads, make our pearly white teeth shine even brighter, naturally lighten the hair, and brighten the skin. Say hello to stronger, healthier, and shinier nails also! Spinach: This leafy green is becoming more popular for its many health and beauty benefits. Not only does it help with eye and bone health, but it has anti-aging benefits and cures acne. Your skin will be glowing with the vitamin A and vitamin C which helps repair skin and improve complexion. Not to mention it combats hair loss and promotes hair growth. No wonder Popeye liked it so much! Beets: Whether you pair it with a nice salad or juice it, beets are ridiculously high in nutrituous value. It helps promote strong and shiny hair growth, purifies the blood and rids it of toxins, and protects the skin from early aging. Not to mention it helps with pesky zits that pop up! Next time you head to your grocery store or local farmers market, check out some of these items. We encourage you to find and try out new recipes that incorporate some of the ingredients so that you can be well on your way to beauty radiating inside out. The moment you get engaged, you will have a beautiful, stunning, and precious ring on your finger at all times. As you break the news to friends and family, they will be thrilled to hear of your engagement and after they take the time to hug, kiss, and congratulate you, they will instantly ask to see your gorgeous ring. As a newly engaged and excited bride-to-be, you are so elated that you want to show the entire world your engagement ring. Imagine that as you reach your hand out to show them the little beauty on your finger, you see gross, chipped nail polish. All of a sudden you aren’t as excited to show off your engagement ring because you are too self-conscience about your overgrown and broken nails. Oh no! Whether you’ve neglected your usual nail care routine, missed an appointment to get your nails done, or you never really paid too much attention to that aspect of your body, now is the time to get focused on presenting yourself with clean, beautiful, and healthy nails. Although this may seem like a minor imperfection, having clean and well-manicured nails is important…especially when flashing that ring of yours. Here are some of our favorite nail polishes collections to give you some ideas on how to paint your nails during your engagement and right before your walk down the aisle. On your wedding day, it is best to have delicate, smooth, and clean looking hands. The can be achieved through getting a nice manicure done prior to the day itself. Perhaps 2-3 days before so that you aren’t rushing on the exact wedding day, but not too far in advance that it chips. To make your nails look clean, try a soft, light, or neutral shade. You don’t want the color to be too bold or bright that it overwhelms your soft white dress. 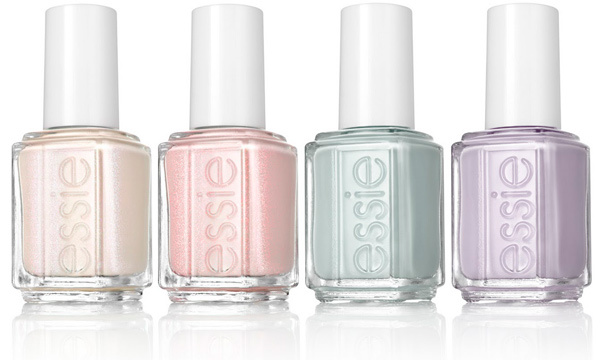 This is a beautiful collection with some pastel colors that look gorgeous especially for fall weddings. The peach shade, Like To Be Bad, is a creamsicle color that would look stunning against tanner skin. The cream shade, Instant Hot, is a lovely off-white color that will help to elongate your hands and make that ring of yours shine even brighter. The soft mint shade, Who Is The Boss, takes a very hot trend and subdues the color to make it wedding appropriate. 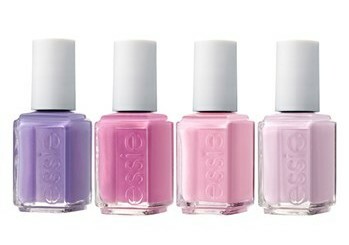 The purple shade, Love and Acceptance, is a gorgeous lavendar color that is feminine but isn’t your typical pink color. The colors in this collection are a bit more vivid and brighter than last year’s shades; however, they are still softer colors that will not draw the attention away from your bouquet or wedding dress. These colors are beautiful shades that aren’t the traditional off-white or white shades and are perfect for a spring wedding. The pink in the upperleft, No Baggage Please, is a pale rose pink color. The polish below that in the bottom left, My Better Half, is a bright peony color. The lower right hand shade, Meet Me At The Altar, is the lightest shade of the collection and is a pale, subtle, and romantic color. The purple shade, Using My Maiden Name, is a lavender shade with a gorgeous blue tint to it. 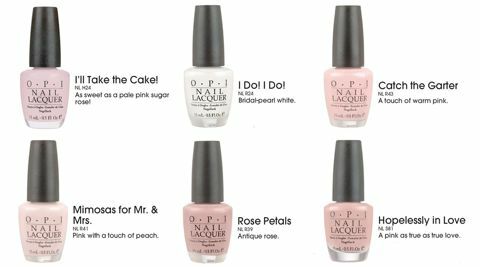 The entire OPI Wedding Collection line was created with a soft, feminine touch in mind. None of these colors will take away from your look, but it will instead complete it. All of these shades have a pink tone to it. I’ll Take The Cake has a light dusty rose tone to it and if you want a darker dusty rose color, Rose Petals is the polish for you. Mimosas for Mr. and Mrs. is a light and romantic pink color whereas Catch the Garter is a more vivid pastel pink. Hopelessly In Love is a peachy pink shade that has hints of orange in it. For all our brides who prefer a shade other than pink, I do! I do! is a white shade that is a great alternative. As a bride, you want to present yourself in a very put together manner full of poise, elegance, and class. The way you act is a major part of how you present yourself, but the way you look also plays a part. Having your nails painted will give you that extra boost of confidence and will complete your entire look. What do you think? Which shade are you most tempted to try? Previously on the blog we have discussed the Zuca case brand and some other viable options for over-the-shoulder cases. Today on the blog, we are taking it a step further and are reviewing some rolling makeup cases. Rolling cases in general are great for transporting product over long distances. However, each case has it positive aspects as well as some challenging elements for makeup artists. Founder Annie Lam has once again created this review to help other makeup artists find their perfect case to best suit their collection. She has specifically reviewed the four cases that have been a part of her makeup journey so she has first hand experience using all of these cases. Let’s get into it! The metal exterior of this case was an amazing feature that protected the products within. 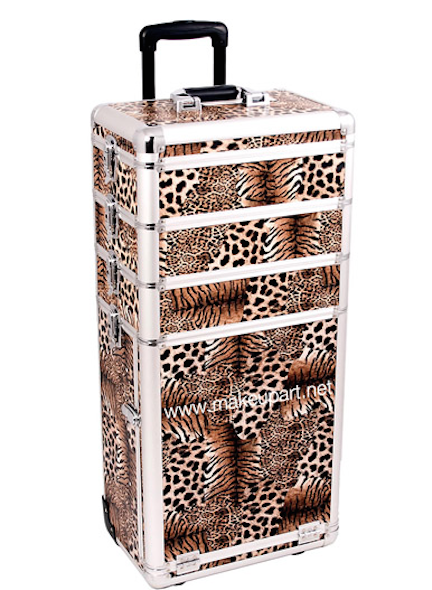 This case is a popular makeup case and can be found at many stores and is easily accessible. Additional features of this case are the four main compartments to store your collection. This case fits a massive amount of product. 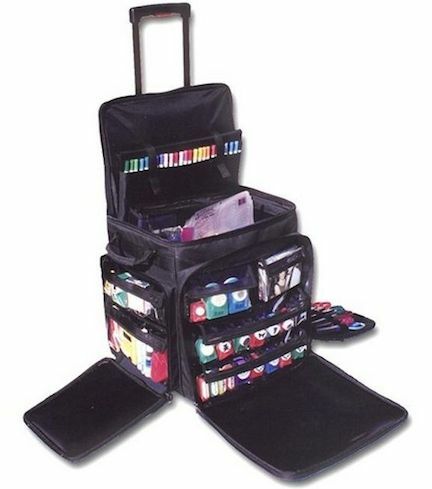 The bottom compartment alone has 2 drawers each with dividers for storage and a brush holder. The other 3 compartments have dividers that you can utilize to organize and effectively hold your makeup collections. This is the perfect case for mobile storage. Since the case is made out of metal, it got heavy quickly. Currently, Annie is using this to store makeup that she doesn’t use as often. This soft-shell case is meant to hold office supplies, but Annie transformed this bag into a case that could accommodate her budding makeup collection. The different compartments in the front pocket are very helpful in organizing your most used products. Inside the actual case is one big compartment in the middle. Unfortunately, it does not have compartments built in, so you can just take makeup bags to organize your different types of makeup and then stack everything in the middle. 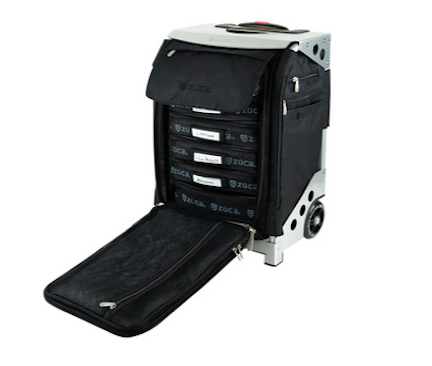 The wheels on this case roll pretty well and overall the bag is heavy-duty and very durable. As your makeup collection grows, this case will probably not be enough space for you. 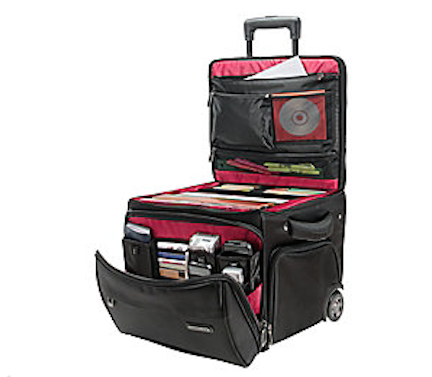 Generally, this case is a great option for smaller collections if a makeup artists is just starting off and needs something reliable to roll around to jobs. This is actually a craft bag used for projects like scrapbooking. The case came with original dividers that Annie took out and replaced with her own bags where she organized her makeup. The front pockets are great to store things because the compartments are clear and are very large. The side pockets hold even more materials and help keep the products you reach for the most close at hand. After a while of using this case, the wheels might wear out due to wheeling around almost 50-60 pounds of products. However, this case will fit pretty much everything you need for a job and will make transportation in one trip a breeze. As a working makeup artist, you need to scope out the best case suitable for you. No makeup collection is the same and no makeup artists is the same. This has been Annie’s experience with her makeup cases and she is sharing her expertise with you. Go out there and try some cases to see which one works best for you! Let us know in the comments below what case you are using right now…we’d love to hear it!